Greenhouse gases (GHG) originating from human activities have caused increasing concern because of their role in global warming and climate change. A sustainable solution of the problem relies on promoting the use of renewable energy, encouraging low carbon lifestyles among the public, especially the young generation. The key factor in the success depends on active engagement of the young and the promotion of their social and environmental awareness through well informed environmental education programs. Meanwhile, carbon emissions from anthropogenic sources are facing tighter control by different government to mitigate climate change. Estimation of such emission has been relying on the top-down approach by consumption of power and fossil fuels with large uncertainties. A network of CO2 monitoring with high time and spatial resolution combined with air quality modelling can provide a promising approach to estimate carbon emissions for better regulation and more accurate understanding of carbon cycle. The goal of the Community CO2 (COCO2) monitoring network is to establish an education and scientific programme with student-centered but high quality CO2 measurement and data sharing network among local schools in Hong Kong to promote their environmental awareness of global warming and to educate students on scientific thinking through participation in research work. 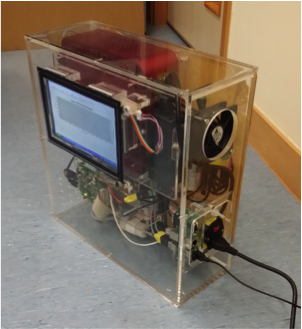 A low cost and robust CO2 monitoring network based on CityU technology is being established in typical urban areas in Hong Kong with automatic data transmission for real time data acquisition. Real time CO2 concentration, temperature and humidity are retrieved from multiple sites and transmitted to central server.